The ExecuChef Knife bag is the ideal carrying case for all Kitchen utensils. With 14 pockets and three zippered compartments, you can easily transport and entire knife set, kitchen ware, spices, recipies, cutting board and any other utensils that the traveling chef might need. Our lightweight and stylish design is sure to turn heads. The bag is made with ballistic nylon and polyurethane leather to protect against stains and cuts. We are confident that our product will see you through the toughest of kitchen nightmares. We hope you enjoy it and if for whatever reason, you dont, please let us know. We are always open to feedback! ★ PERFECT FOR THE TRAVELING CHEF - The ExecuChef Professional Knife Bag is made to comfortably transport all of the cooking essentials that a traveling chef might require. ★ EXTRA SPACIOUS - Our Knife Bag measures 20H x 12L x 3.5W. With 14 pockets and 3 zippered compartments, you can easily store an entire knife set, cleaver, kitchen ware, spices, cutting board, tablet, phone, charger, business cards and any other accessories. ★ LIGHTWEIGHT AND PORTABLE - Weighing a mere 1.45 lbs. 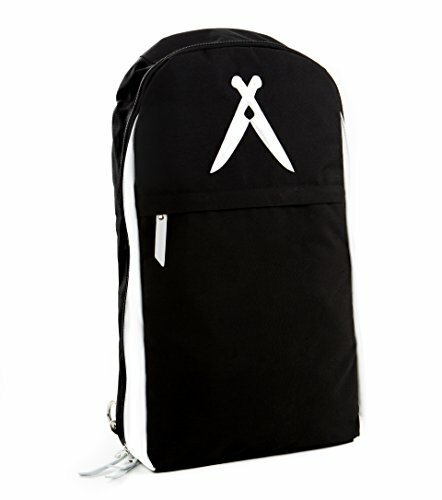 and with an extremely comfortable design, you can adjust the strap to go over your right or left shoulder. The bag can easily hold over 30 lbs. as needed. ★ DURABLE AND STYLISH - Our Knife bag is made with ballistic nylon and polyurethane leather to protect against scratches, cuts and stains. It also includes heavy duty metal buckles and clips to support any extra weight. ★ SATISFACTION GUARANTEED! - We hope you enjoy our bag and if for whatever reason, if you don't, please let us know and we will immediately credit you with a full refund within 30 days. We are confident in our product and we hope you will be too! If you have any questions about this product by ExecuChef, contact us by completing and submitting the form below. If you are looking for a specif part number, please include it with your message.